ow NCAA amateurism crushed a college athlete entrepreneur. Jonathan Benjamin was perplexed. Thought it was some kind of joke. What had he done wrong? Absolutely nothing. At least not by any fair, reasonable standard. On the other hand, this is a story about the make-believe world of college sports amateurism. So fair and reasonable don't really apply. It was the summer of 2012, and Benjamin -- a walk-on basketball player at the University of Richmond -- had been summoned to his school's athletics compliance office. An intern was there, examining Benjamin's social media pages, hunting for pictures of the rising senior wearing clothes he had designed himself. Pictures with his name. Pictures with his face. Benjamin was hopeful. The clothes were his babies. His dream. Maybe his future. "You like the stuff, huh?" he asked. Less than a year earlier, Benjamin had started his own sports apparel company. He loved sports. Fashion, too. Began sketching T-shirt designs as a child. Never stopped. He wanted to work for Nike someday--- or better yet, create the next Nike. He was a marketing major, an enthusiastic student, and his company began as a class project, potential logos and slogans drawn in the margins of his notebooks. Official Visit Activewear. The Best Fit. Benjamin founded the company on his 20th birthday, just before his junior year. He flipped the cash he received in gifts -- "a couple hundred bucks," he says -- into three orders of T-shirts. He pitched his clothes on Facebook and Tumblr. Leaned on his business professor for advice. Marketed to fraternities and sororities, teammates and friends who were college athletes, even his coaches. Official Visit shirts began popping up on campus, and every dollar Benjamin made he put back into the business -- except for the $200 he donated to a home for troubled children, a decent chunk of his total earnings. For the next nine months, Benjamin played basketball, grew his company, got the best grades of his life. He was focused. Fired up. He never expected to earn a living as an athlete; the son of an engineer and project manager, he always wanted to be a entrepreneur, find a way to harness his creative interests. Official Visit turned out to be his best fit, and everyone at Richmond seemed to support him. As the intern scrolled away, school director of compliance Maura Smith broke the bad news. A student-athlete may establish his or her own business, provided the student-athlete's name, photograph, appearance or athletics reputation are not used to promote the business. "That was the part that I was most confused about," Benjamin says. "Dang. As a clothing line, my business is image-based. And if I can't use my image, what am I going to use?" "Did they want me to hire models?" I've said this before and I'll say it again: In college sports, justice isn't blind. To the contrary, it's a blind, trembling man throwing darts in a pitch-black room, hoping to strike a coveted recruit scoring a gratis airplane ticket -- or perhaps a star player receiving cash for autographs -- and instead hitting the industrious likes of Benjamin right between the eyes. And matters can't be otherwise. Not unless the NCAA and its member institutions abandon the bogus philosophy at the heart of their economic model. Because snobby English aristocrats who didn't want to row crew against unwashed factory workers created a philosophical justification for blatant classism that was adopted by Oxford and Cambridge, copied by Harvard and Yale and aped by other American universities? Because athletic department boosters making priority seating season ticket "donations" deserve a federal tax break, while college athletes who are permanently hurt on the job don't deserve worker's compensation? Because Alabama football coach Nick Saban thinks agents are pimps, with the probable exception of his own? Because the ability to bid for athletes outright -- and not via indirect recruiting inducements like palatial training facilities -- might allow cash-flush, football-first schools like Alabama and LSU to stockpile top talent and perpetually play for bigger bucks and national championships, all while smaller conference schools are left fighting for scraps? Because otherwise athletic departments will cut women's lacrosse, while Big Ten commissioner Jim Delany heroically leads his conference out of the multimillion-dollar television network wilderness and into the pure, morally uncompromised promised land of Division-III? Because without a de facto salary cap, the market for promising young football and men's basketball players will become a scary, monstrous, self-immolating Wild West, just like the markets for plumbers and dentists and college sports administrators? Because the only thing standing between the fragile American consumer economy and a second Great Recession is a free-spending rentier class of D-I Football Bowl Subdivision athletic directors making a reported average of $515,000 a year? Amateurism is a lie. A phony, bankrupt ideal. And here's the thing about bad ideals: They make for bad rules. Which lead to bad enforcement. Which produces bad outcomes. Benjamin's experience is illustrative. After all, he played by the rules. Just not the NCAA's rules. At Richmond, he majored in marketing. During a summer school course, he saw an entrepreneurship video featuring Kevin Plank, a former Maryland walk-on football player who founded the sports apparel company Under Armor. The message? Be fearless. Don't try to perfect your idea before you run with it. Start your business now. Built and refine it as you go. Benjamin was inspired. He earned an A-minus in the class. Back home in Rochester, N.Y., he asked his mother, Kay, to drive him to City Hall, where he filled out a "doing business as" form. He subsequently opened a business bank account, finalized his company logo, set up social media accounts and ordered his first set of shirts from a local supplier. "He already had everything planned out when he came home for the summer," Kay says. "He knew what he wanted to do." "It was refreshing for us as parents to see," says Benjamin's father, Jim. "The way he was taking to his classes, understanding what a brand is, what marketing and sales are all about, applying some of what he had learned in school. We were excited for him." So was Adam Marquardt. A longtime entrepreneur who has started several small businesses -- including, once upon a time, a sports apparel company -- Marquardt was Benjamin's summer school professor. He quickly became a mentor, a friend, a sounding board for business ideas. How does this T-shirt design look? Should I give out free promotional bracelets? "Jonathan is certainly one of my favorite students that I've ever had," Marquardt says. "As a professor, you dream of students like him. He's the picture of what we hope for in academia -- somebody who is not relying on us to give them all the answers, but using what they find in class as a springboard to learn and do and experience more. There's never any grass growing under his feet. He walked on to the basketball team. He served as my research assistant on data collection. He was a full-time student. And to take on a business in spite of that? There are a handful of students that can take it to that next level. I viewed his company entirely positively. "The next thing I knew, it was last summer, and Jonathan came in and was like, 'I got a problem.'" The problem, Benjamin explained, was simple. And also complicated. Richmond had declared him ineligible to play basketball. Which meant that he likely wouldn't be able to accompany his teammates on a long-awaited summer trip to Italy. Even though Benjamin had tried to follow NCAA rules. In fact, said effort was where the problem started: The Rochester factory that supplied his T-shirts wanted to feature Benjamin in a company newsletter. Benjamin wasn't sure if that qualified as a news story (permitted by the NCAA) or a promotion (verboten). He checked with Smith in the school's compliance office. Smith asked the Atlantic 10 conference for guidance. The conference compliance office looked into Benjamin's business and discovered that he had posted pictures of himself wearing Official Visit gear on company Facebook and Twitter pages. "The only reason I didn't use Instagram is that it wasn't cool when I started in 2011," Benjamin says with a laugh. "I would have been leveraging that so hard. The business school encourages us to do things. The feedback from my teammates and coaches was positive, too. Everyone in the locker room would giggle when coach would say, 'We have an official visit this weekend.' It never crossed my mind that I was doing something wrong." Benjamin's parents were equally surprised. "I think that the NCAA should promote and applaud that kind of performance coming out of the classroom," Jim Benjamin says. "When Jonathan was going through all of this and I was describing it to my colleagues in the business world what he had to deal with as a student-athlete, they would shake their heads and say, 'Really?'" Yes. Really. Benjamin took his pictures down. With Smith's help, he applied to the NCAA for reinstatement -- noting that school president Edward Ayers put special emphasis on business students learning and practicing entrepreneurship. The NCAA granted his request. He made the trip to Italy. Played a final season of basketball. Nevertheless, amateurism hurt his company. His future. There's nothing wrong with wearing a shirt in a picture, Smith told him. We would rather you guys have clothes on in pictures. Great. Only Benjamin couldn't use his own name. He couldn't use his own face. Nor could he tap his friends who were campus athletes, the same friends who had helped create buzz for his brand in the first place. "They saw what happened to me and didn't want to get ineligible," Benjamin says. "They thought if they had a picture, they would get kicked off their teams. Not just my school. Other schools, too. Everyone stopped wearing [Official Visit]. I was trying to push for stuff to come out in the fall and no one was excited about it. No one knew what they could and couldn't do to support me. That was the most frustrating thing for me. People were looking at my company like it was a dirty thing." Evan Joseph can relate. A former Richmond football player, he was a junior when Benjamin was a sophomore. The two were friends. They shared a passion for clothing, constantly swapping ideas. A few months before Benjamin started Official Visit, Joseph and three teammates created an apparel line of their own. They called it "Loaded." Like Benjamin, Joseph was thinking about his future. He was a psychology major. His teammates were studying marketing. He already had endured two surgeries for football injuries. A NFL career was unlikely. "Everybody wants to go, but only a small number make it," he says. Business was the next logical step. A rising senior, Joseph also wanted to finish his college football career. As such, he was paranoid about losing his eligibility -- unlike Benjamin, he kept his name and face out of Loaded promotional materials, and even kept his mouth shut during a group interview for a student newspaper article about the company. Just in case. "To not be able to put my face on it on campus, to be in that spotlight, I was upset," Joseph says. "But I didn't know if it would be an infraction. We actually had some of our coaches who wanted some shirts. We didn't know if that would be an infraction. We had this operation going -- first athletes supporting us, then students, then faculty -- and at the same time we sort of had to hide from the NCAA. "Not to sound arrogant, but the football team won a national championship my freshman year, conference championship my sophomore year. The basketball team made the Sweet 16. We helped the school get publicity. Meanwhile, the academic side is telling us that this is a place to grow and spread your wings. Only we can't do that fully. And some of us were studying marketing!" The "remaining eligible" page of the NCAA's website says this about amateurism: Maintaining amateurism is crucial to preserving an academic environment in which acquiring a quality education is the first priority. Hogwash. Countless students across the country also work for money. Many hold campus jobs. They still acquire quality educations. Similarly, some athletes take classes while playing professional sports. Somehow, they manage to earn both credits and degrees. Actress Natalie Portman even filmed a "Star Wars" prequel while attending Harvard. The movie was just so-so -- but the school's arts department and overall academic environment did not implode. So why was Benjamin barred from playing basketball and fully pursuing his one-time class project, as if the latter would somehow taint the former? "At one point I used this phrase with Jonathan: It's the cost of being a member," Smith says. "The rule protects all the stud football and basketball players that would use it to funnel money through their 'self-made businesses' to actually be paid to play. You can actually understand why the NCAA has this rule if they are going to have amateurs." In an unintentional way, Smith is right: Amateurism is protection. Not for athletes. For everyone else. It protects schools from having to competitively bid for sports talent. Protects existing power structures. Protects bottom lines. Years ago, UNLV basketball player Greg Anthony founded a successful T-shirt company, one that helped him support his cancer-stricken mother and hemophiliac sister. 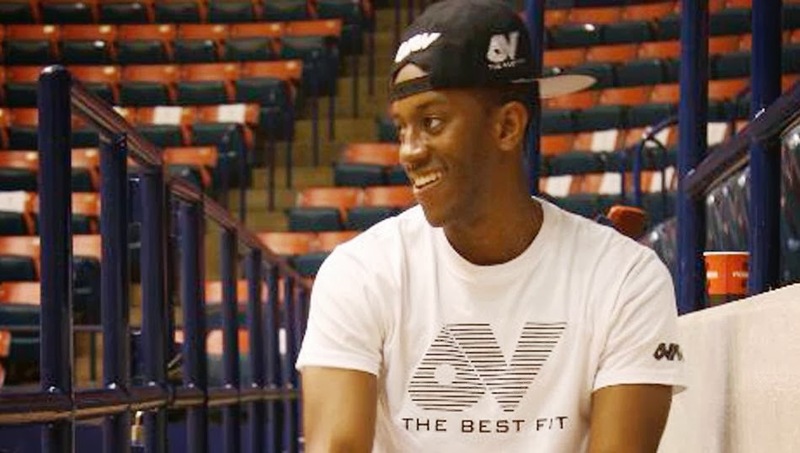 The NCAA told Anthony he couldn't keep his basketball scholarship and operate his own business. He renounced his scholarship. The association told him he still couldn't operate his own business, because boosters and cash and blah blah blah. Only what, exactly, was Anthony doing wrong? Even if his entire business model actually had consisted of selling a single box of shirts to a handful of wealthy boosters -- let's say for $25,000 -- why, exactly, would that have been wrong? Because the NCAA said so? Because that same $25,000 otherwise might have been donated to UNLV's athletic department? When Benjamin wore his self-designed sportswear on a social media page for his own company, he was committing a violation; when he wore a Nike-designed basketball jersey with his school's name across the front, he was preserving the collegiate academic environment. "Do I find that hypocritical and ironic?" Marquardt says. "I do. Our compliance people were great. But the NCAA sets things up so it's incredibly difficult for most student-athletes to go out and build their future pathway during the time that they're in school. Think about all the great entrepreneurs who did that. Kevin Plank's ideas came in school. [Nike founder] Phil Knight's were in school. [Microsoft founders] Paul Allen and Bill Gates. [Dell Computer founder] Michael Dell. As students, they saw an opportunity. They saw a need and decided to do something about it. Jon saw that. And the NCAA with all its advertising and messaging says that's what they want their student-athletes to be." Benjamin is hardly alone. SUNY Cortland lacrosse player Andrew Duffy reportedly shut down his stick-stringing business to avoid eligibility problems. Texas A&M quarterback Johnny Manziel ultimately could be ruled ineligible for allegedly signing autographs for money. Again: What did either person do that was so terrible? When ESPN college basketball analyst Jay Bilas recently pointed out that typing the names of prominent college football and basketball players into the search box of an online NCAA store made the individual jerseys of those players appear for sale, Emmert called it "inappropriate" and said his organization was "exiting that business." Meanwhile, Louisville recently banned its football players from signing autographs during a fan appreciation day, citing a "national problem." Problem? That's one way to look at it. A backwards one. After all, there is nothing wrong with making money. Especially when people who enjoy sports are happy to spend it. Moreover, there's nothing wrong with capitalizing on one's fame. Ours is an era of social media, personal branding, self-sustaining celebrity. We are all Kardashians now. College athletes preparing for life in the 21st century American economy shouldn't be barred from using their names and faces as promotional tools; to the contrary, they should be encouraged to do so. "I never thought about amateurism before this," Benjamin says. "I didn't get it. Now that I think about it, what if a better player than me on my team had come up with my idea? I think it would be awesome to be a starter and have 40,000 followers on Twitter and be able to do this. You work to be that good. Nobody gives you those followers. You're doing something they appreciate. The rules take away our ability to use what we worked hard for. It's not guaranteed that our likeness and image will help us -- if [former Duke guard] Austin Rivers had made a clothing line, it might not have been cool. But the NCAA takes away our ability to use the attention we get to present something great." Benjamin remains in business. He recently released a beach-ready tank top. He finally can use his name and face to promote it. Joseph remains in business, too. His new product line is called Spread Your Wings. Both young men love their alma mater, appreciate their educations. But as entrepreneurs, both wish things had been different. Bad ideals beget bad rules. Bad rules spawn bad outcomes. In trying to prohibit activity that isn't actually wrong, the NCAA punishes activity that's inarguably right. For college athletes, amateurism isn't the best fit. It's the worst.